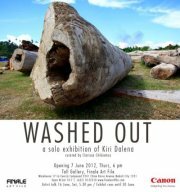 Washed Out, a solo exhibition of artist Kiri Dalena, opens at Finale Art File’s Tall Gallery on June 7, 2012, Thursday, at 6 pm. Running until the 30th of June with an artist talk on June 16 at 5.30 pm, the exhibition presents a video installation which focuses on the effect of typhoon Sendong in Iligan. The videos in the exhibition consist of documentation taken by Dalena during the aftermath of Sendong. An installation of logs, three of thousands which had been washed out during the typhoon, provides a certain tangible presence of the event within the space. The exhibition is curated by Clarissa Chikiamco and presented with the support of Canon Philippines. Finale Art File is at Warehouse 17, La Fuerza Compound, 2241 Chino Roces Avenue, Makati Metro Manila. It is open Mondays to Saturdays, 10 am-7 pm, and may be reached at finaleartfileinc@gmail.com or at (632) 813.2310. This entry was posted in Biswal and tagged Art, bagyo, batang Pilipino, CagayanDeOro, children, cultural work, environment, exhibit, gawaing pangkultura, human rights, Iligan, kababaihan, kahirapan, kalikasan, land, lupa, magsasaka, Makati, Mindanao, photography, Sendong, sining, trahedya, typhoon, women. Bookmark the permalink.